Handmade beauty products are a fun and easy gift to make for birthdays and holidays. An easy favorite is handmade lip balm. you’ve never made lip balm before, know that it’s as easy as throwing ingredients together, melting them, and then pouring it into tubes. 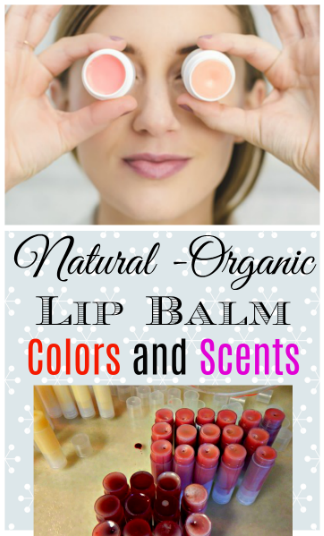 Plus, you can make natural lip balm colors and scents for a variety of fun scents and shades. I recently shared how to make Chocolate Truffle Lip Balms. They smell delicious and are creamy and smooth. This is my main recipe that I use and stem all varieties off of. Use this recipe below and add the colors and scents according to your own preference. Have fun and be creative! Create a double boiler by placing a glass bowl or glass measuring jar in a saucepan of boiling water. Add the beeswax, cocoa butter, shea butter, and sweet almond oil to the double boiler and stir on and off over low heat until everything is melted. Add natural colorants while on low heat and stir until combined. Remove from heat and add essential oils if desired. Pour into pots or tubes to cool. ***TIP*** When filling lip balm tubes, fill until they almost overflow. The lip balm will shrink as it cools and can leave a hole down the middle. But it's just cosmetic, so don't stress if that happens. It's hard to get them full enough without them overflowing. TIP: You can pour the lip balm into lip balm pots like these, or lip balm tubes like these. You can also get something like this crafting tray to make pouring easier. Note: All colors will fade as the lip balm cools, so make it much darker than the color you want. Add all colors while waxes and oils are melting and whisk well. Pink – Add 1 teaspoon to 1 Tablespoon of Beet Root Powder. This will create a light pink. It will get to a point where adding more will not making it more pink, it will just sit on the bottom. For a darker pink to red, use the next recipe. Deep Red – Add 1 teaspoon alkanet root powder and 1 teaspoon beet root powder. Red/Purple – Add 1 Tablespoon alkanet root powder. Orange/Pink – Add 1 Tablespoon orange Moroccan clay (Now brand Moroccan clay is tan, so make sure to find a naturally orange clay like this one) and 1 teaspoon alkanet root powder. Change proportions according to the shade you prefer (more or less orange). Orange – Add 1 Tablespoon orange Moroccan Clay. Brown/Red – Add 1 Tablespoon beet root powder and 1 teaspoon cocoa powder. Peppermint – Peppermint and cocoa is a wonderful and popular scent and flavor. Try using 15 drops of peppermint essential oil. Vanilla – Vanilla oil can be added to the lip balm to create a decadent chocolate truffle scent. Add 15 drops of vanilla oil. Cinnamon and Clove – Some people are sensitive to cinnamon and clove so make sure to use cinnamon leaf, not cinnamon bark. Add 5 drops of each. Add more if desired. Orange – Orange can be combined with any of the scents listed here. It’s wonderful with cinnamon, mint, or on its own. Add 15 drops. Lavender – Lavender is soothing to the skin; gentle, and healing. Add 10-15 drops of lavender essential oil. Lavender is wonderful with vanilla as well (smells like candy!). Cypress and Lime – Cypress, like peppermint, increases blood flow. It is a natural lip plumper. Combined with lime it makes a wonderful earthy, energizing scent. There you have it! 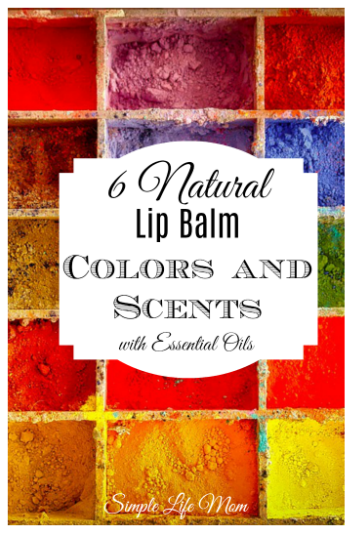 6 Natural Lip Balm Colors and Scents. Not get creative and tell me about your projects, who you’re making for, and what your favorites are. Thank you for your generous heart in sharing your experiences and recipes for a simple and healthier lifestyle. 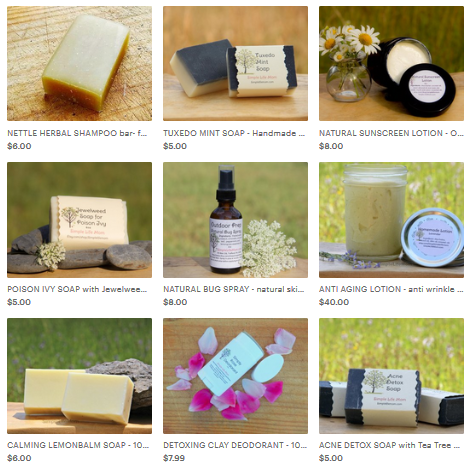 I am just getting started in this journey and have referenced your blog for most all of my handcrafted soaps, shampoo bars, lotions and laundry detergents. I was so excited about your site that I asked for your soapmaking book for beginners for a Christmas present from my son. 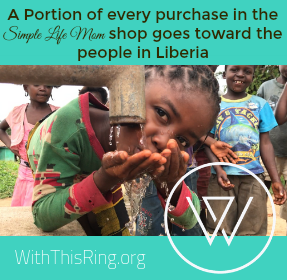 Best gift ever….it keeps on giving. That’s so wonderful to hear Tracy. I’m so glad you’re enjoying it and getting good use out of everything.